Eastern Washington is a region of the United States defined as the part of Washington east of the Cascade Mountains. 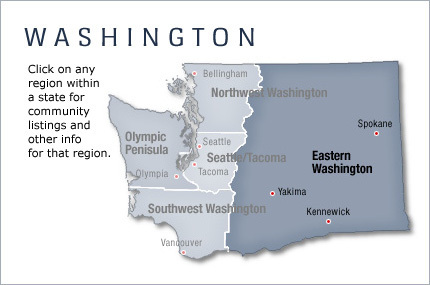 Compared to Western Washington, Eastern Washington has roughly twice the land area and one-third the population. According to the U.S. Census Bureau the population estimate as of 2004 was 1,371,802, less populous than King County alone. The population growth rate between the two is roughly the same. Of Washington's nine Congressional districts, Eastern Washington is nearly exactly comprised of two (the 4th and 5th), aside from a small portion of the 4th in Skamania County. In the 2004 election, this region voted 59% for Republican Dino Rossi, while the Western half voted 53% for Democrat Christine Gregoire.